Blue Gouramis are among the hardiest aquarium fish on the market. 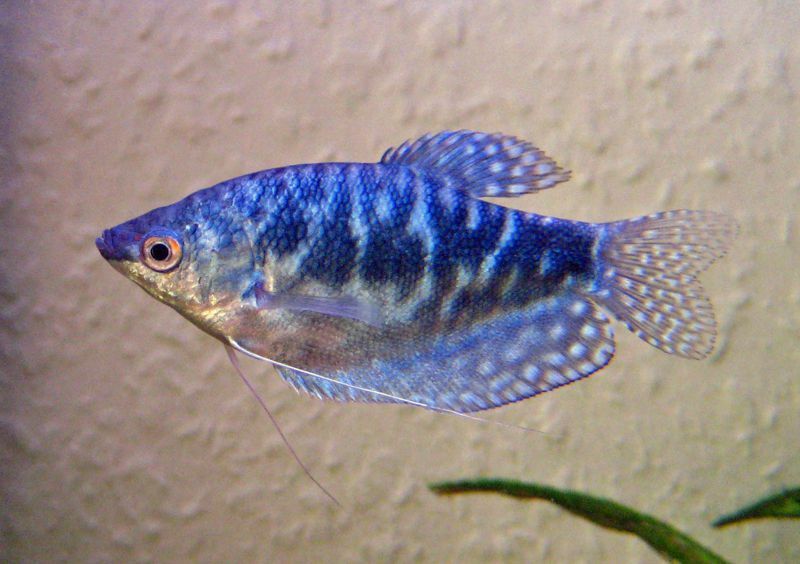 A color variation of the Three Spot Gourami, they sport only two spots—one in the center of the body and a second at the caudal pentacle (beginning of the tail). Where is the third spot? It's the eye! Usually silvery blue, their colors change considerably with their moods. During spawning, they acquire a much deeper blue hue. The Opaline or Cosby Hybrid variation lacks spots and has a darker blue marbling, and are rarely available for sale. This widespread species occurs naturally throughout southeast Asia. It may be found in the Mekong River basin in southern China, Vietnam, Laos, Cambodia, Thailand, Myanmar, Malaysia, Sumatra, Java, and Kalimantan. Outside of its native range, it has been introduced in Sulawesi, Philippines, Taiwan, Papua New Guinea, the islands of Reunion, Seychelles, Namibia, the Dominican Republic, Puerto Rico, and Colombia. The Blue Gourami frequents shallow lowland marshes, swamps, and peatlands, but may also be found in streams and canals or, at flood season, in flooded forests. The Blue Gourami. which is usually whitish blue, is a natural color variation of the Brown or Lavender Gourami. Its two spots (one in the center of its body, the other at the base of the tail); if these spots start to fade, it's likely your fish is experienced serious stress caused by overcrowding or poor water conditions. The species has a long, flattened body with large, rounded fins as well as a labyrinth organ which allows them to breathe air directly. Adult males reach up to five inches in length and females are slightly larger. The scientific name trichopterus is derived from the Greek words trichiasis (hairy) and pteron (wing), referring to their long, hair-like pelvic fins in which touch-sensitive cells are located. Blue Gouramis are territorial, and can clash with certain species. Avoid dwarf gouramis, guppies, goldfish, angelfish, and bettas. Better options include Tetras, Loaches, Danios, Mollies, Platies, Barbs, and Scavenger Catfish. Select species of a similar size to the Blue Gouramis to avoid aggressive behaviors. Blue Gouramis are one of the hardiest of the Gourami family. Their preference is for thickly vegetated waters of any type, as their natural habitat includes ditches, canals, ponds, swamps, rivers and lakes. Blue Gouramis tolerate a wide range of temperatures and are not demanding in terms of water conditions. However, they prefer soft, slightly acidic water during the breeding season. Young Blue Gourami need tanks no bigger than 15-20 gallons, but as they grow to adulthood they will need 35 gallons. Though they do have a labyrinth organ and can breathe air if absolutely necessary, it is important to keep the tank well-filtered; you can also add air stones to improve oxygenation. You may want to provide a darker substrate simply because it makes such a pretty contrast against the colors of the Blue Gourami. Blue Gouramis are exceptionally easy to feed as they will accept virtually any foods, from flake to freeze-dried to live foods. They will consume hydra voraciously and are prized for their ability to eliminate this pest from the home aquarium. Sexes are primarily differentiated by the shape of the dorsal fin, which is long and pointed in males compared to the females' shorter rounded dorsal. Females that are prepared for spawning will show a pronounced swelling in the breast area, while the male will have a far more slender girth. Both sexes display a much deeper blue color during breeding periods. Because the male can be rather aggressive during spawning, the aquarium habitat should provide ample places for the female to take refuge. Failure to do so can result in injury to the female. Spawning begins with the building of the bubble nest by the male, which usually occurs early in the day. After a suitable nest has been prepared, the male will attempt to entice the female under it by swimming back and forth, flaring his fins and raising his tail. The female signals her readiness by biting his back; he responds by repeatedly brushing his back against her belly before taking her into a spawning embrace. During spawning, the male wraps his body tightly around the female, turning her on her side or back so the eggs will rise unimpeded to the surface. This close embrace is also important because it brings the reproductive elements as close together as possible. Because sperm cells survive only a matter of minutes in the water, the timing of their release and proximity to the eggs is critical. Just before the sperm is released, the pair may be observed quivering—a sure sign that spawning is near completion. The eggs are released immediately thereafter and are fertilized by the time they reach the bubble nest. The pair may repeat the process a number of times over the course of several hours. It is not unusual for the number of eggs produced to reach into the thousands. Once spawning is complete, the female's involvement is over; remove her to prevent an attack by the male. From this point forward until they hatch, the male will tend the eggs, carefully rearranging them and returning any errant eggs back to the nest. The male Gourami may spit streams of water, an interesting phenomenon often seen during breeding. It is believed the purpose of this behavior is to keep the eggs positioned within the bubble nest. The eggs hatch in approximately 30 hours. Feed the fry should infusoria and nauplii. Perform frequent water changes as the fry grow, especially during the third week which is when the labyrinth organ develops. Otherwise, check out all of our other pet freshwater fish breed profiles. Is a Black Ruby Barb a Good Addition to Your Freshwater Aquarium?